As you know, we have big plans for our house. We have built an addition on the house, which almost doubles the size of the house, and we eagerly plan the layouts of the rooms in that addition. What you don't know, however, is the area I am most looking forward to enjoying isn't inside the house at all. You see, we have big plans not just for the inside of the house, but also for the outside of the house. More specifically, the deck we plan to build, which will wrap around the front and one side of the house and have a screened-in gazebo type area on the corner. In the gazebo area is where I will have my patio furniture. Then, I will be able to enjoy the Summer evenings without the bugs. For during the day, when I want to grab a good book (or my laptop) and be outside enjoying the sunshine and fresh air of a beautiful day, I'll be able to kick back and relax on the wicker furniture which will beautify other areas of the deck. I'll be able to sit outside in comfort, with my camera next to me in case I see a photo opportunity, and blog! Life doesn't get any better than that! I love the sun and love to soak up the rays. However, if the sun gets too bright and is making it difficult to read, I'll have no worries, because I'll just use one of my patio umbrellas. If you can't tell, I've been dreaming about this 'dream deck' for quite a while, and I've got big plans for it. 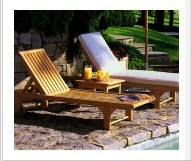 I've even been window shopping at Today's Swim and Patio (todaysswimandpatio.com). So, when that last nail gets hammered in the deck, I'll know exactly which furniture I want and where I want it. Well, I guess I should be patient and wait until there isn't snow on the ground. What? Oh, you think I should wait until the deck is built? OK, maybe you're right. I'm excited for you...sounds like a dream! That sounds like it is going to be a nice area! Enjoy it! I'm not at all surprised you want to spend as much time as possible outside. One of these days we're going to put a patio in - and I know it will be a great place to spend time. When it's warm, of course. I've always dreamed about having one of those, too. The bigger the better!!!! I really want to have that kind of patio in my house. Thank you for posting this kind of article.